Food Philippines includes many of the large range of rice and glutinous rice delicacies, and we have to say there are many dishes in this range to try. 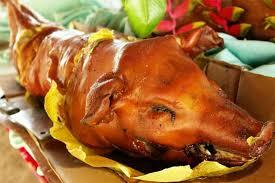 They include puto, kutsinta, tinupig and patupat, binagkat, linapet and impaltao, incalti, dudol and many others. Each one has its own unique taste worth sampling, some you will not stop at one. Patupat is boiled glutinous rice that is lightly seasoned with salt and sometimes black pepper, then lovingly wrapped in banana leaves to form a triangular shape. Binagkat is an Ilocano puto maya which is boiled glutinous rice flavored with molasses and coconut oil and seriously addictive I have to say and quite sweet. Linapet is a sweeter version of patupat, and is also wrapped in banana leaves. The impaltao is water soaked malagkit encased in pouches that are made from bamboo strips, and then later cooked in boiling sugar cane juice bennal. It is prepared during the sugarcane harvest season. Rather sweet but absolutely delicious. Incalti is the generic term that is used for the process of cooking and sweetening food in sugarcane juice. Balls of ground glutinous rice are the most common ingredient used for incalti. Dudol is a mixture of ground glutinous rice flour, water and sugarcane juice, that is slowly mixed by hand as it cooks over a slow fire. Where is Pagudpud? Pagudpud or Pagudpod as its occasionally called is wonderful one day and perfect the next. And countless people will tell you that it's the Boracay of the North. We explain that it is Boracay as it once was! And that's why it's so popular. It is Boracay as it was 25 years ago or maybe even more! The consummate white sands of Saud Beach are situated at Pagudpud and well worth the long journey. The drowsy rural coastal village of Pagudpud is located on the most Northern tip of Luzon, in the Philippines and is about 50 miles up the coast from Laoag City, the capital of Ilocos Norte province. It is also in the region of 350 miles north of Manila, you may drive, catch a bus or take a flight to Laoag City and then a two hour drive or bus ride.